Last week, scientists were pulling together the latest data for NOAA's monthly report on the climate when they noticed something strange: One of their key climate monitoring stations had fallen off the map. All of the data for Utqiaġvik, formerly Barrow – the northernmost city in the United States – was missing. No, Utqiaġvik hadn't literally been vanquished by the pounding waves of the Arctic Sea (although it does sit precipitously close). The missing station was just the result of rapid, man-made climate change with a runaway effect on the Arctic. 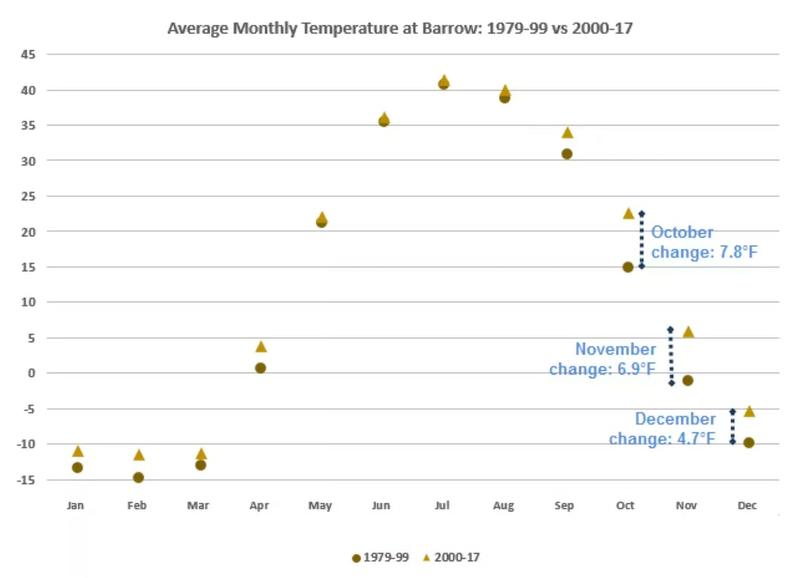 The temperature in Utqiaġvik had been warming so fast this year, the data was automatically flagged as unreal and removed from the climate database. It was done by algorithms that were put in place to ensure that only the best data gets included in NOAA's reports. They're handy to keep the data sets clean, but this kind of quality-control algorithm is only good in "average" situations with no outliers. The current situation in Utqiaġvik, however, is anything but average. If climate change is a fiery coal mine disaster, then Utqiaġvik is our canary. The Arctic is warming faster than any other place on Earth, and Utqiaġvik is in the thick of it. With less and less sea ice to reflect sunlight, the temperature around the North Pole is speeding upward. The missing data obviously confused meteorologists and researchers, since it's a record they've been watching closely, according to Deke Arndt, the chief of NOAA's Climate Monitoring Branch. He described it as "an ironic exclamation point to swift regional climate change in and near the Arctic." Just this week, scientists reported that the Arctic had its second-warmest year – behind 2016 – with the lowest sea ice ever recorded. The announcement came at the annual meeting of the American Geophysical Union, and the report is topped with an alarming headline: "Arctic shows no sign of returning to reliably frozen region of recent past decades." "The current observed rate of sea ice decline and warming temperatures are higher than at any other time in the last 1,500 years, and likely longer than that," the NOAA report says. At no place is this more blatantly obvious than Utqiaġvik. In the short 17 years since 2000, the average October temperature in Utqiaġvik has climbed 7.8 degrees. The November temperature is up 6.9 degrees. The December average has warmed 4.7 degrees. 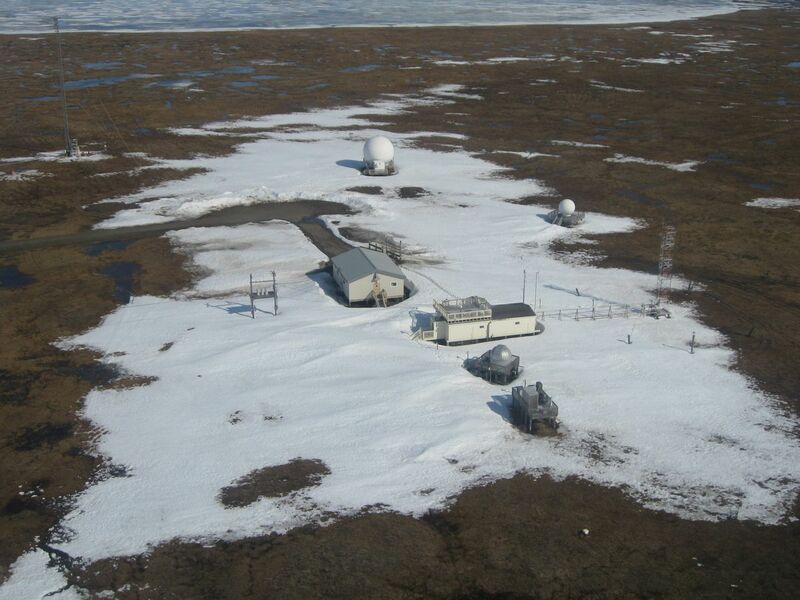 The Utqiaġvik temperatures are now safely back in the climate-monitoring data sets. Statisticians will have to come up with a new algorithm to prevent legitimate temperatures from being removed in the future.